RRA’s RRAGE represents innovation and intelligence in “value” AR design. Manufacturers of Modern Sporting Rifles (that’s PC talk for AR-15’s, in case you’ve been hunkered in the bunker a bit too long) seem to have wrung every possible variation out of the AR platform. You thought kids could come up with endless combinations for Lego blocks? They don’t have anything on rifle makers trying to configure new ways to expand their MSR lineups. For many manufacturers and assemblers, the rule seems to be, “If it fits, it sticks.” So, given the AR’s modular design, there’s a whole lot of fittin’ and stickin’ going on out there and there has been for a while. To be honest, some of it has grown a bit wearisome. Even with its hairy-knuckled single-stage trigger and lightweight, unlined barrel, 1.25 to 1.50" groups at 100 yards right out of the box on a sketchy field rest were easy. But as we walk the range our jaded eyes occasionally spy something that gets our attention. Something that makes us pause and think, “Okay ...that’s kinda neat” — exactly our reaction when we saw the new RRAGE carbine in 5.56 NATO from Rock River Arms. In a sea of black anodized “me too” rifles, this one floats apart. To give credit where it’s due, Rock River products already stand out in the AR scene without gimmicks. The company is guaranteed to build firearms that are both reliable and accurate, having proven it over the last two decades among black gun enthusiasts and LE agencies nationwide. No matter the platform or the flavor, these two objectives bear out in every RRA product we’ve tested — from the entry-level LAR-15’s to the more purpose-driven configurations and calibers. So when the company presented us with an early production model of the RRAGE and explained how it represented an exercise in creating the absolute lowest-possible-priced Rock River AR-15 — while adhering to the company’s core mandate of “reliable and accurate” — we extended the benefit of the doubt. Plus, the thing just looked cool and therein lays the second hook. The proprietary upper receiver and handguard assembly delivers a fresh look and comfortable operation more akin to a premium-priced monolithic upper. The sleek, free-float handguard seamlessly blends with the upper, both made from extruded 6061T aluminum. The scope is TRUGLO’s new Omnia. There are many manufacturers with enough purchasing muscle to — if they so desired — make a low-buck, bare-bones AR-15 with respectable performance. It wouldn’t be anything to run in a precision match but a solid SHTF rifle for propping behind the kitchen door or stowing in the truck. That wasn’t where Rock River Arms wanted to go with the RRAGE. For their new value-priced rifle, the RRA crew sought to take quality, performance and style a significant step above the more austere AR-15 while maintaining an entry-level price. In doing so they developed a slick upper receiver and handguard assembly that looks, at first glance, like a monolithic, one-piece upper. This is what caught our eye. When monolithic/polylithic uppers started to gain traction several years ago, fans of the AR gave a nod of appreciation for the design concept and potential applications. Solid-piece construction, free-float barrel, smooth and seamless profile, a unified top rail … what’s not to like? “The price!” you say? Well, there is that. Tight tolerances, pin indexing and multiple set screws ensure solid mating of the handguard and upper receiver. To offset the cost of producing a monolithic upper, RRA went the two-piece upper/handguard route, designing proprietary components with crisp lines and tight tolerances to deliver an assembly with a unitized look and feel. Both components are made of extruded 6061T aluminum. The flat-top upper exhibits the sharp, authoritative lines common to more expensive billet uppers. Missing is a forward assist and a conventional-style cartridge deflector. The latter function, however, is served by extending the blended handguard profile to the rear of the ejection port. It’s a sleek design that keeps the upper’s clean contours while allowing hot brass to kick off the corner of the ejection port and away from the shooter. Set forward of the upper is a matching handguard. As with the upper receiver, the handguard includes an integrated MS1913 rail, giving the upper assembly a full-length top rail system. MLOK-compatible slots along the sides and bottom offer the necessary accessory attachment points. 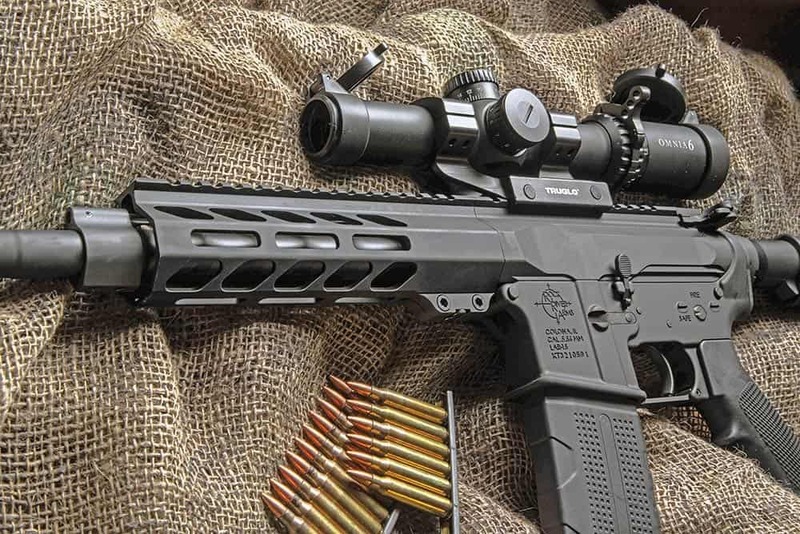 The handguard is a free-float design that secures to a proprietary barrel nut while an index pin affixed to the handguard offers precise alignment with the receiver when installed. This, combined with super-close tolerances between the handguard inner mating surface and the outside diameter of the barrel nut plus the two clamping screws and two set screws, ensures a rock-solid attachment. Overall, the upper assembly achieves its goal of delivering a monolithic receiver look and feel without the exorbitant price. As for the rest of the rifle’s construction, it’s mostly baseline RRA hardware with the same basic LAR-15 forged aluminum lower receiver the company’s fans are familiar with. There are no surprises with the standard manganese phosphate bolt carrier group, charging handle, A2 pistol grip, RRA six-position stock or A2 muzzle device. A low-profile gas block fronts the carbine-length gas system. Where the RRAGE does veer off the well-trodden RRA path is the barrel. While it’s the same basic 16" lightweight chromoly version found throughout much of the company lineup (with a 1:9 twist), the difference is the barrel isn’t chrome-lined. This may be a big deal for some folks and a negligible one for others but it’s the cost of admission (or price savings, depending on how you look at it) for this rifle. Another cost-cutter is found in the trigger assembly. RRA went with their single-stage model versus the two-stage unit found in most RRA rifles. Being spoiled on more refined two-stage and premium single-stage triggers, we had to adjust our expectations here. Trigger performance aside, the rifle performed quite well where it counts. Out-of-the-box with zero barrel cleaning or break-in, we managed to quickly sight in with TRUGLO’s new 1-6x24 Omnia scope and pull off consistent 1.25 to 1.5" groups at 100 yards from a sketchy field rest. For an AR backed with Rock River Arms’ reputation, the premium looks of a monolithic-style upper assembly, and an available street price around $700 (MSRP is $759.99), the RRAGE is an easy decision for anyone looking to add to their stash without guilt.